Taking your horse on a walk down the road can be a challenge. 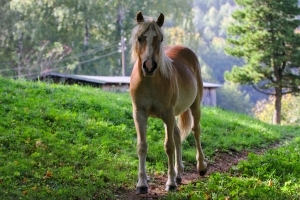 A horse may become easily spooked by passing traffic or nervous to venture away from home. Here are a few tips that will gradually allow you and your horse to take a nice trip down the street. Walk your horse down a quiet road for 10 to 30 minutes every day. Allow them to stop and sniff so they can get used to their new surroundings. After a week, walk them for longer and no longer allow them to stop. During the second week, ride the horse with a saddle, sometimes a horse mood changes when they have a saddle on their back. Ride your horse during the third week and finally mount them at their calmest point. After they become used to being walked with you mounted on them you can progress to jogging and trying out different gaits, just be sure to progress slowly, letting your horse get used to the changes. Soon you and your house will be ready for any road. Be sure that you get your horse insured, the Ark International Group specializes in Equine Insurance. Contact them today to find out which coverage is best you and your horse.